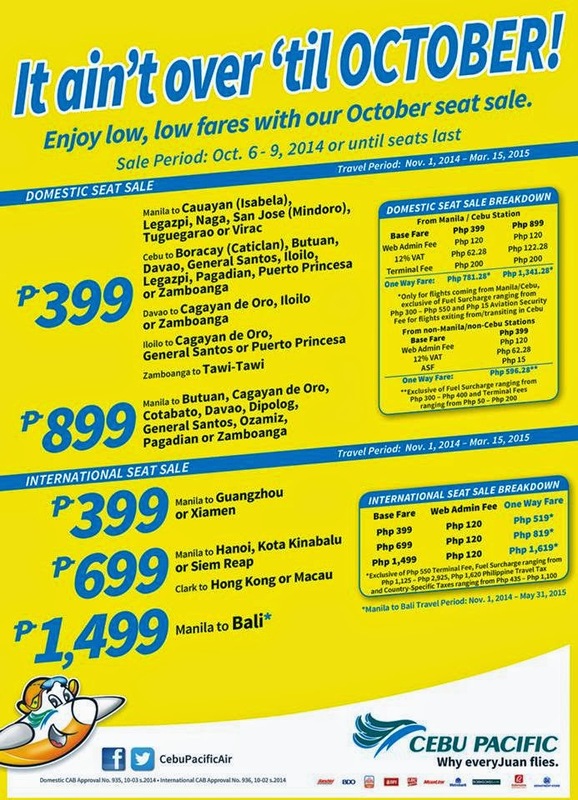 Cebu Pacific Promo Fares 2019 to 2020: Low Fares for October 2014: Travel 2015! Low Fares for October 2014: Travel 2015! Cebu Pacific Promo Fare 2015: It ain’t over ’til OCTOBER! Enjoy low, low fares with our October #CEBseatSale. Selected destinations from Manila to Isabela, Legazpi, Naga, Mindoro, Tuguegarao, Virac. From Cebu to Boracay, Butuan, Davao, GenSan and many more! Quoted INTERNATIONAL one way fares are inclusive of Base Fare, Php 120 Web Admin Fee, and 7 kg hand-carry baggage allowance but exclusive of International Terminal ​Fees ranging from Php 550, Php 1,620 Philippine Travel Tax, Fuel Surcharge ranging fromPhp 1,125 – Php 2,925, Country Specific Taxes ranging from Php 420 – Php 1,200 and check-in baggage. Promo fares have limited availability and are non-refundable but rebookable subject to the following rebooking fees: Php 1,200 for Domestic destinations and Php 2,000 for Short-haul International destinations plus fare difference. Please note that booking fee rates range from Php 120 –Php 200 depending on purchase channel. For your convenience, flight changes, availing of prepaid baggage allowance for check-in baggage and web check-in service can be done up to 4-hours before scheduled flight. Book one now at http://bit.ly/CebuPacificAir. Hi, Thanks for inquiring. As stated above, it's only the BASE FARE. There are mandatory taxes and fees that you need to pay. Or you may please do a mock booking po thru cebupacificair.com or visit any nearby ticketing office or agency or call these nos. for inquiry: Call (02) 70-20-888 in Manila, (032) 230-88-88 in Cebu or visit this FB page every once in a while regarding promo updates for your preferred trips. Thank you. Hi, Thanks for inquiring. Promo fare for your preferred trips are currently unavailable. you may please do a mock booking po thru cebupacificair.com or visit any nearby ticketing office or agency or call these nos. for inquiry: Call (02) 70-20-888 in Manila, (032) 230-88-88 in Cebu or visit this FB page every once in a while regarding promo updates for your preferred trips. Thank you. Salamat po sa Low Fares for October 2014: Travel 2015! Sana makapag book ako nito..
You're welcome! Please visit this blog every once in a while regarding promo updates for your preferred trips. Thank you. Where can we book it plz ? Hi I want to avail this promo manila-catiklan and vice versa. Date in between of December 21-Jan 4, 2015. Thank you. hello i like to avail this promo manila to virac and back. from Dec 20 - Dec 29. how can i book this promo? i try to book online but need promo code......please advice...thank you..
Hi, Thanks for inquiring. There's NO NEED for a PROMO CODE. you may please do a mock booking po thru cebupacificair.com or visit any nearby ticketing office or agency or call these nos. for inquiry: Call (02) 70-20-888 in Manila, (032) 230-88-88 in Cebu or visit this FB page every once in a while regarding promo updates for your preferred trips. Thank you. meron bang Bacolod to Manila? Hi I want to avail the promo on Dec 18-Jan 3,2014 or any In between that date, kalibo -manila and vice versa. Hi, Thanks for inquiring. please do a mock booking po thru cebupacificair.com or visit any nearby ticketing office or agency or call these nos. for inquiry: Call (02) 70-20-888 in Manila, (032) 230-88-88 in Cebu or visit this FB page every once in a while regarding promo updates for your preferred trips. Thank you. Nakita ko po kc sa website nyo na may promo Manila to Tacloban.Up to Oct. 13 ung seat sale.Pero ng nag try na ako mgpabook wla naman po ako maKtang promo don bale pinaka lowest fare is P2,000 +.Pano po mkaka-avail ng ganong promo? May promo po ba kayo papunta puerto princesa palawan? magkano po cagayan to manila po....ilng buwan n po ankong nag-aabang sa promo ninyo...sana mayroon..
goodmorning just wanna ask if may seats paba na available even tapos na ung promo? Wla bang promo manila to Bohol or tagbilaran? may available seat pa po ba ang clark-hong kong ng Nov.7 umaga po ang flight??? meron po bang promo octuber 28 to oct.30 balikan na pomagkano po ba? Meron pa po ba promo ngayun?? Tapos february ang alis??? hi anu mangyayari sa prebooking na nagawa ko pag hindi nabayaran in due time..na hit ko kc ung continue under payment section.. Ask q lng ala n b promo zamboanga city -manila..travel period jan 2015..
Hi 899psos lng b babayaran ko mnla to butuan? Wla n bang charges nyan? My promo po ba manila to iloilo? pabook sana ako ng nov 16 hongkong to manila wala naman akong credit card....paano ba yon? I want to ask f there is promo this coming december or january 2015...?? Helo poh magkano poh ang one way ticket from Singapore to iloilo airport flyt for november 28? Pwd poh mag booking? May promo po ba butuan -manila?? May promo ba kau ng manila-zamboanga june2015? May promo ba may 1 2015? Seat Sale for 2015 Flights! P99 Promo Fare to Beijing or Shanghai! March 2015 Promo Fares Is Here! Piso Fare 2015 Promo for June to September! Low Fares For January to March 2015!